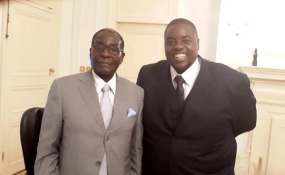 Wicknell Chivayo and former president Robert Mugabe (file photo). Former President Robert Mugabe has been fingered in the Gwanda solar project saga which saw his former lieutenant, Samuel Undenge jailed for two years. Mugabe's name was mentioned in court after Noah Gwariro, former Zimabwe Power Company director testified against Undenge for authorizing a tender to Wicknell Chivhayo's Intratek Zimbabwe without bank guarantees. "It was during that time when I was still employed as the MD with ZPC and Intratrek was awarded a tender but they had no bank guarantees, which were part of the terms and conditions in the tender contract. Gwariro added that after Undenge came from the so called high authorities, he had no power to object but rather gave a go ahead to Chivhayo's company. According to the state Chivhayo was corruptly awarded the Gwanda solar power plant tender which he failed to develop despite getting $5 607 814,24 from government. Mr Zivanai Macharaga from the President's Special Anti-Corruption Unit is representing the State, while Mr Alec Muchadehama is appearing on behalf of Undenge.